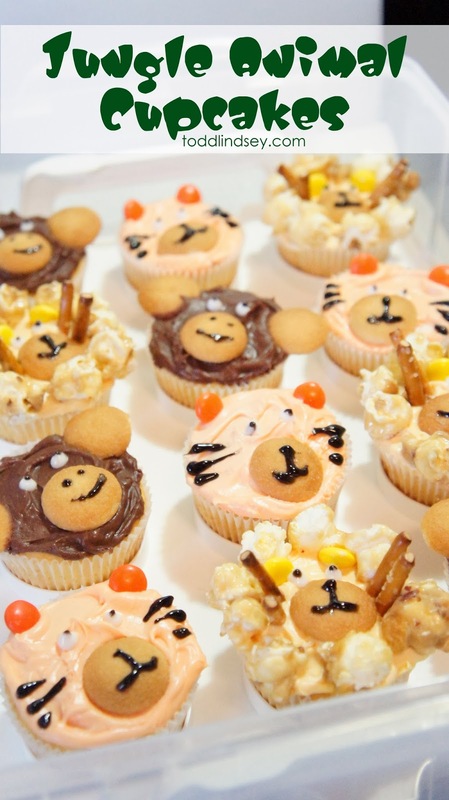 Domer Home: Jungle Animal Cupcakes & Surprise Baby Shower! 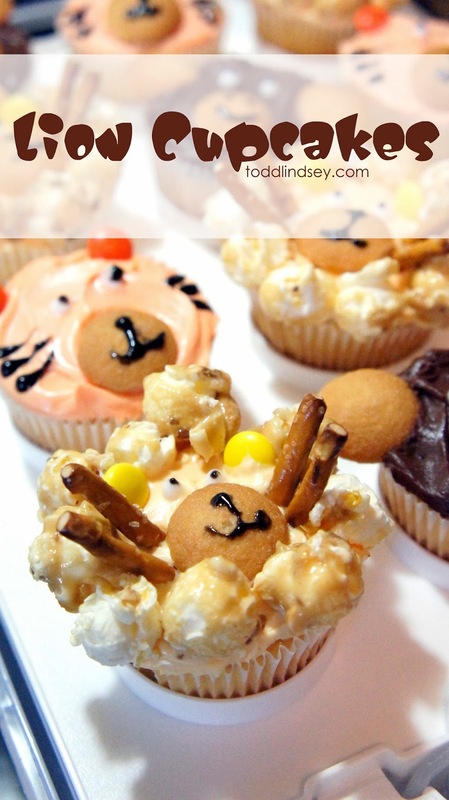 Jungle Animal Cupcakes & Surprise Baby Shower! 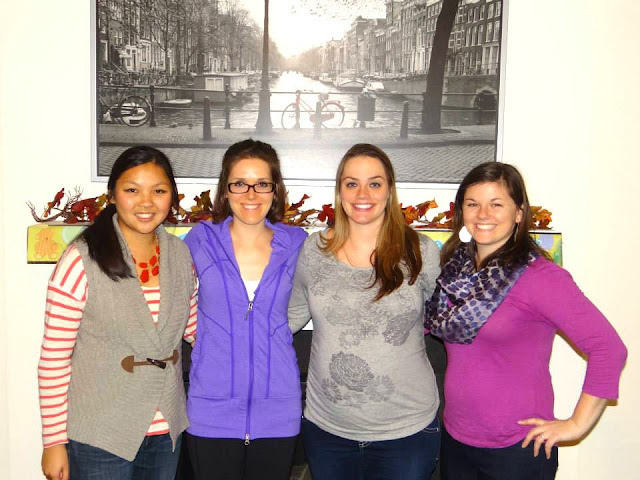 The past several weeks, Melissa, Lyndsey and I have been planning a surprise baby shower for our friend Rachel. 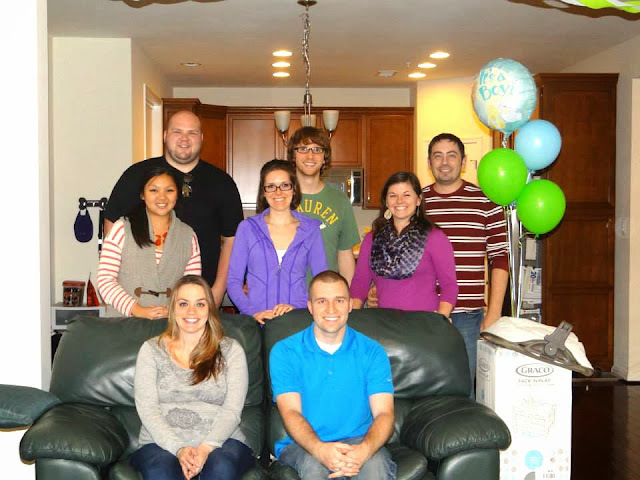 Rachel and her husband Blake had a baby shower in Kentucky but we wanted to give them a Maryland shower! Baby Gunnar is expected to debut on December 7th. We all met for lunch at Union Jack's on Sunday after church. Rachel had no clue what was going to happen later! After lunch, we all headed over to Lyndsey and Ben's new house. I told Blake to take his time (he was in on the surprise) but he ended up getting lost anyway so it worked out perfectly. All the rest of us were able to get to the house and in place before they arrived. We all yelled, "Surprise!!!" when Rachel and Blake walked through the door. It was so much fun! We all pitched in and got them a pack 'n play. Melissa, Lyndsey and I went baby shopping and found lots of little goodies to fill the pack 'n play with. Lyndsey went all out and got balloons and some baby shower decorations. Ben hung up streamers in the living room! Everything looked really festive! Blake and Rachel (mostly Rachel) opened up all the gifts first. Blake was really good at handing her things. After gifts, we did a couple baby games. 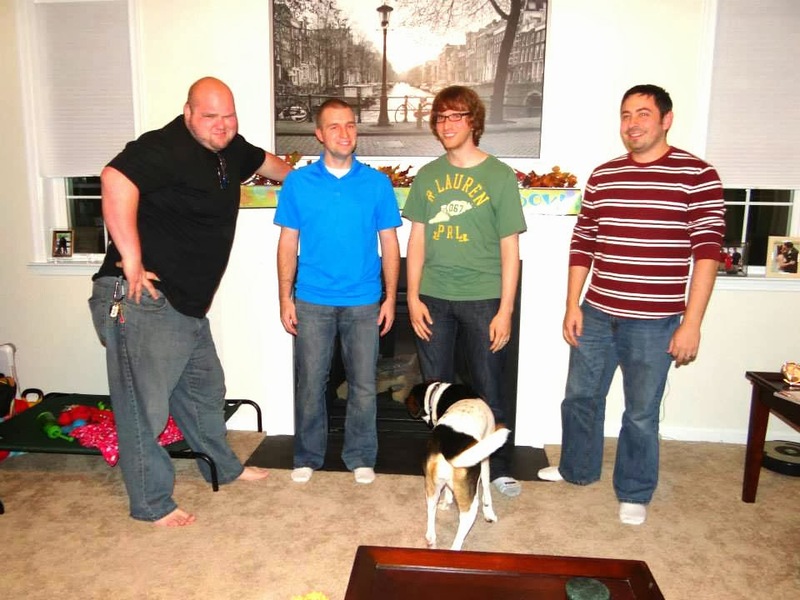 We didn't go crazy with the baby games since there were guys involved. The first game was to guess how many Skittles were in the sippy cup. I guessed 124 (I think!) but it ended up to be over 200. Rachel won because she guessed the closest! Todd was pretty thrilled with all the baby games. Next, we played Name that Baby Song! Todd dominated. Even though I had played this exact game a year ago, I failed pretty miserably. And our winner! Todd I am so proud of you. I am glad that your knowledge of guilty pleasure and baby songs can come in handy. Even though we had just come from lunch, all the presents and games made us hungry! Lyndsey made some delicious Funfetti dip served with animal crackers. And I brought the cupcakes. 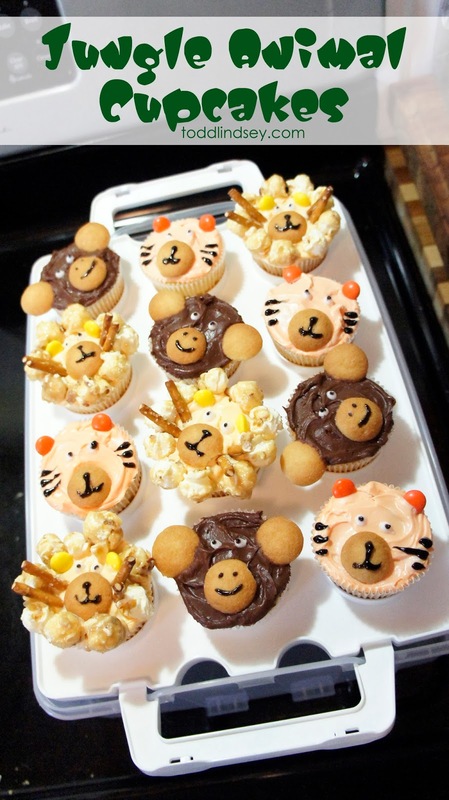 I did a jungle animal theme and made tigers, lions and (not bears! oh my!) monkeys. I used a regular yellow cake mix but I added extra butter and eggs and stuff to make it a little richer. The lion cupcake has caramel corn for the mane, Reeses Pieces for the ears and pretzels for the whiskers. 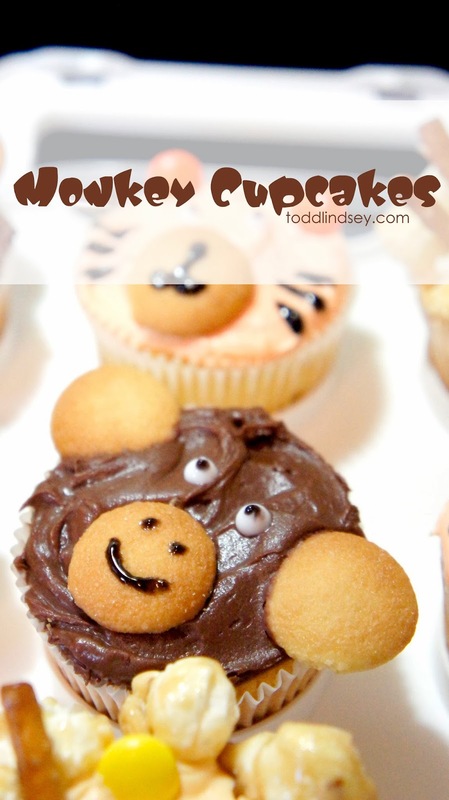 All the animals have mini Nilla Wafers for the nose and the monkeys have them for ears as well. 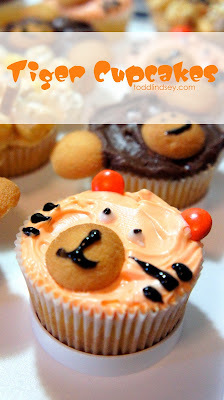 The tiger has orange Reeses Pieces for ears. 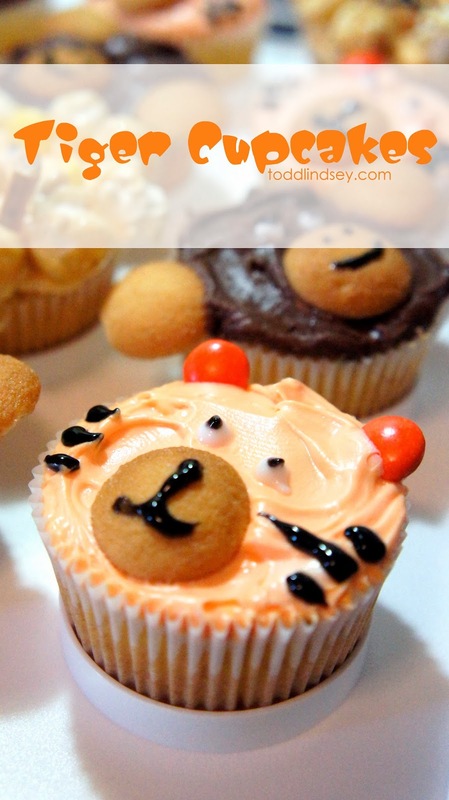 I used store-bought tubes of black and white gel frosting for the facial features. The cupcakes looked super cute! Unfortunately, our fridge froze most of them and when they thawed out, the cookies and caramel corn were pretty soggy. Oh well, it's the thought and effort that counts, right? After some major snacking, we fooled around, hung out and played Apples to Apples and Catch Phrase. And when I say "we fooled around" I meant that the guys started measuring their necks and wrists and arm length. And yes, this did happen. Here are some photos that Lyndsey took of all of us. They are so much fun! 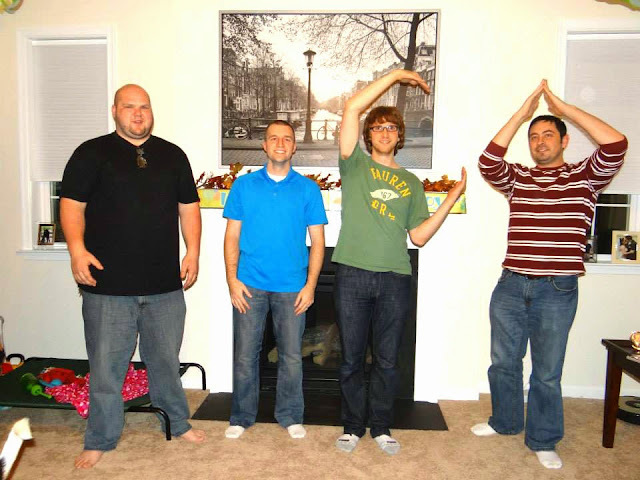 The guys were trying to think of a good pose. Todd's looking a little sassy there. 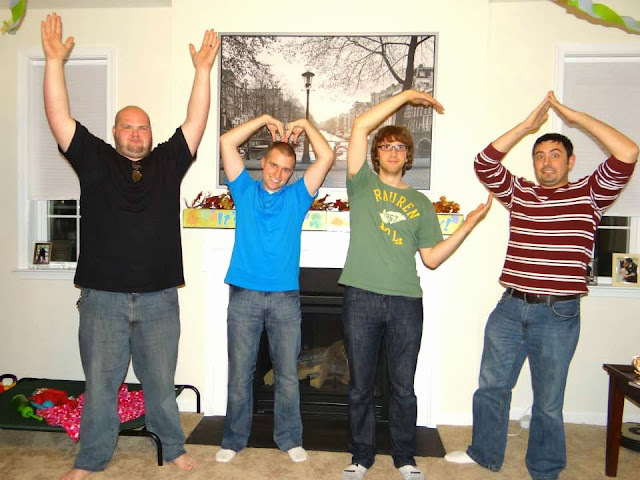 Eventually they settled on the YMCA. Took a few tries though to get it spelled right. 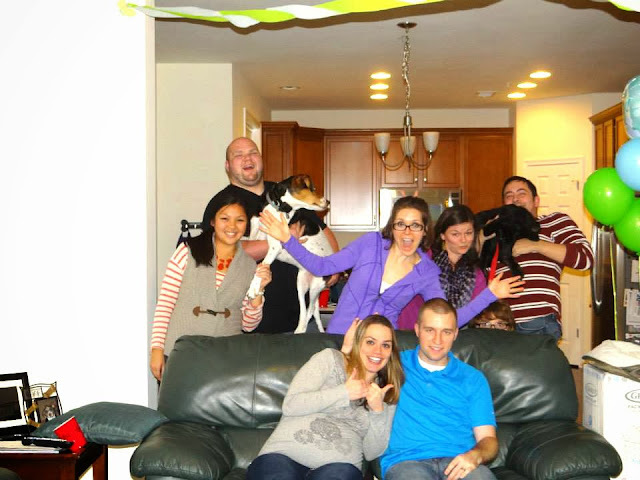 And we used the timer feature to take a couple of group photos... with the dogs! Overall, it was a success! Rachel was surprised and we all had a blast celebrating baby Gunnar! :) I am so blessed to have such great friends in my life! Love ur cupcakes and love that u guys have so much fun with ur friends! Btw..this is Debbie not Danny! Your cupcakes are adorable! 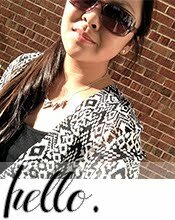 Your friend is very lucky to have you!